Now that I own both an iPhone 5 and a Nexus 7 Android tablet, I’ve been doing a lot of shuffling between different USB charging cords. Sure, it may be a “first world problem,” but my desk always looks cluttered and unused cords tend to get misplaced. We’re probably more likely to hit the lottery than to ever see Apple and Samsung agree on one type of universal charger cable. But that’s okay, because power cable manufacturer Innergie today announced its new MagiCable Duo with Lighting connector. 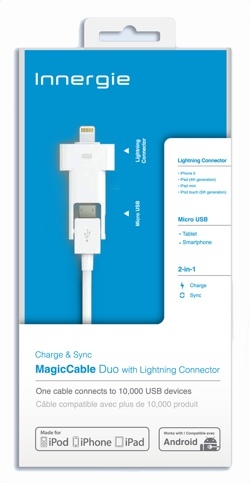 The third-party cable features both an Android Micro USB connector and a Micro USB-to-Lighting converter that also allows you to power your Apple devices as well. When you're using the Micro USB connector, the converter piece swings out of the way so you don't have to worry about losing it. If you’re going to buy an extra cable for your smartphone, you may as well buy one capable of powering all your devices. Third-party cables can be notoriously hit or miss, but Techlicious’s own Suzanne Kantra has had success with Innergie products in the past. “I’ve used the company’s other duo and trio products and they’re high quality,” she told me earlier today. The Innergie MagiCable Duo is available in retail stores and online at myinnergie.com for $29.99 (MSRP). Purchase a Duo direct from Innergie’s online store and the company will throw in a USB wall charger for free while supplies last. My original charging cable that came with my Samsumg Galaxy Express smartphone started to short out and caused me to a real headavhe keeping my phone charged. Called warranty dept at ATT and they were out of that cable, so they sent me a travel charger cable that not only charges my phone up faster but also keeps it fully charged as long as I keep it hooked up! And it is 6’ long which is 3’ longer than standard cables are, which I really think is an Improvement! And It was done free of charge under warranty and shipped fedex overnight So kudos for excellent service to ATT!